Exceptionally clean and very well maintained 35 Carver 350 Aft Cabin powered with Twin Crusader 454’s starboard engine has 225 hours since new and port has 25 hours since new. All systems are set up with a freshwater flush. New Bimini Top and Enclosure. Interior layout has two staterooms and two heads with a spacious salon and galley. A must see Carver that is in turn key cruising condition. 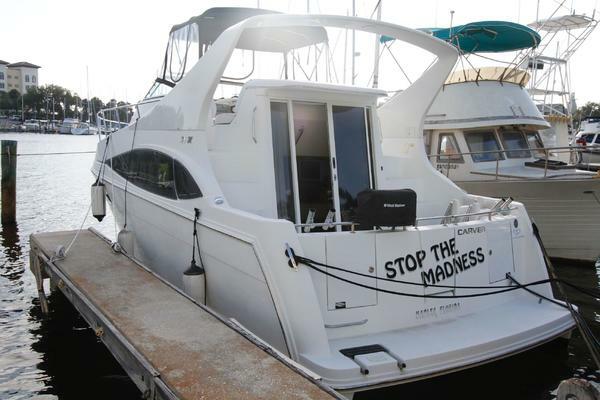 West Florida Yachts would love to guide you through a personal showing of this 35' Carver 350 Aft Cabin 1993. This yacht for sale is located in Wildwood, New Jersey and priced at $59,900. For a showing please contact us by filling out the form on this page and we will get back to you shortly! No Items Not Originally Delivered From Carver Are Included In The Sale. No Personal Items Are Included.